TOMI's branded line of products. This represents the next generation disinfectant for the decontamination industry. The product which is registered with the EPA as a Hospital-HealthCare Disinfectant, Effective Broad-Spectrum Disinfectant. TOMI's disruptive technology that utilizes plasma science. What is the science behind the technology? SteraMist produces a visible mist/fog, which is composed of the Reactive Oxygen Species (ROS), the Hydroxyl Radical. These are created by mechanically altering the sole active ingredient, hydrogen peroxide, in TOMI's BIT solution, by passing through the cold plasma arc. Learn more about the iHP Process. Where can SteraMist BIT be used? SteraMist products may be used in a variety of settings, please refer to our EPA registration for all use sites. Learn more about our divisions. TOMI has proven that the aerosol is nontoxic and is labeled as only an irritant. It has superior compatibility towards all products and materials including delicate hospital equipment and sensitive pharmaceutical and biosafety lab technologies. See material compatibility studies. The comprehensive TOMI training program instructs all end-users on the appropriate Personal Protection Equipment (PPE) dependent on their specific geographic location. TOMI adheres to OSHA and CalOSHA standards; all respiratory protection is NIOSH approved. Do you offer disinfection/decontamination services? Yes, in addition to purchasing or leasing SteraMist equipment, TOMI offers a fully customized service option service option. How do I get a quote for sales/service? What is the difference between SteraMist and manual cleaning disinfection? Manual cleaning can produce inconsistent results because the user can easily miss areas during the clean. Further, completing a disinfection cleaning protocol with SteraMist offers greater coverage, in less time, and superior results with a 99.999% (six log) reduction and depending on the clean product, a manual clean will only provide a 99.9% or 99.99% (3 or 4 log reduction). Does SteraMist easily fit into a hospital's current cleaning protocol? For C.difficile rooms, all fluids and visible debris needs to be removed with an approved EPA spray product. Then SteraMist is applied. The user sprays, applying the mist for 5 seconds per square foot. A high touch clean for highly contaminated areas can be treated in 3 minutes or less. How does SteraMist compare to chlorine dioxide or formaldehyde? Similarly to these products, SteraMist moves like a gas. However, SteraMist is much less toxic and corrosive than chlorine dioxide or formaldehyde. For those companies that want to move away from potential carcinogenic decontamination processes, which many global regulators are already doing, SteraMist is an effective replacement. How does SteraMist compare to Vaporized Hydrogen Peroxide (VHP)? VHP requires all areas to be completely sealed and pretreated to specific humidity and temperature ranges. These products can be highly corrosive and leave residues that affect materials compatibility. SteraMist is much more flexible (Surface Unit does not require HVAC turned off), non-hazardous to ship and store, and demonstrates superior compatibility with electronics since there is no need to wipe, and no residue is left behind. How does SteraMist compare to UV light? UV light can be effective at short distances and with a clear line of sight. Many UV light systems require the machine to be moved around or multiple machines need to be used for complete treatments. UV lightbulbs have a limited lifespan and are very expensive to replace. SteraMist has low ongoing costs, is easy to maintain, and offers quick and flexible treatment options. How does SteraMist compare to Bleach? Bleach may be inexpensive, however, bleach has high health costs because the safety of its user is at risk. Further, costs can increase because bleach damages materials, stains fabrics, and is difficult to dilute properly and accurately; therefore, receiving an efficant kill may be unlikely. Is SteraMist safe in animal facilities? Which SteraMist product is better for my needs: the Surface Unit, Environment System or is there a custom option available for the space in need of decontamination? Contact a TOMI representative for a personalized assessment and recommendation based on your requirements. See TOMI Site Assessment here. Does SteraMist treat Biosafety Cabinets (BSCs)? SteraMist currently has clients using the Surface Unit to treat BSCs. Further, A TOMI technician can write a protocol for both SteraMist products to be used on a case by case basis. See TOMI Site Assessment here. Is SteraMist safe for electronics? Yes, SteraMist is ideal for electronics. The iHP process provides a dry mist/fog and a short contact time, leaving no residue. 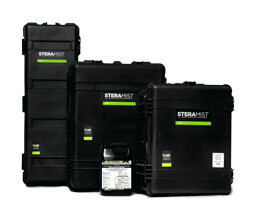 SteraMist can quickly and easily treat electronics including delicate medical and scientific equipment. How long does a surface have to remain wet after being treated with SteraMist? After treatment, all surfaces will be covered with the residual mist/fog, similarly to the way a mirror fogs after a shower, it will quickly evaporate. Can SteraMist be purchased through any Hospital-HealthCare GPO? GSA? Yes, SteraMist products are approved and listed on Premier, Inc., a healthcare improvement company uniting an alliance of approximately 3,750 U.S. hospitals and 130,000 other providers to improve the health of communities. Other GPOs and GSAs are being added shortly.